For years I have been writing my dates in the year, month, day format with a four digit year and two digit month and day. I started this on my own because it made sense to me. Also, this is the most logical format for dates, in my opinion, particularly in terms of technology because by dating folders or files in this way they can be properly sorted in chronological order based on the year the month and then the day. I’ve gotten a lot of flack from friends and co-workers for writing my dates in this way because people do not understand the logic and because they have been taught to write the date in the month, day, year format. 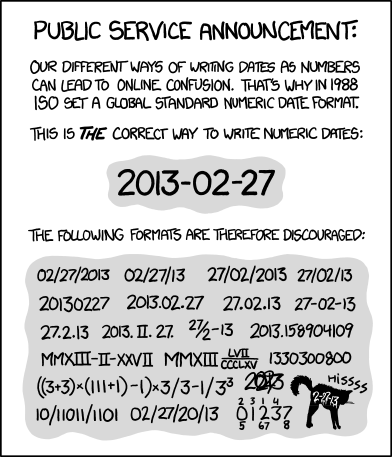 I understand that format because that’s how I was raised to write the date but it is illogical. I had never considered researching this topic at all but I am a big fan of the xkcd comic. The following comic came out a couple of weeks ago and with it I was justified in my formatting of the date. You can read more about the International Organization for Standards (ISO) standard 8601 for representation of dates and times at this Wikipedia article: http://en.wikipedia.org/wiki/ISO_8601. So, haha, I am justified! 😀 Just wanted to share. How do you write the date? Do you understand the logic of the ISO standard? Hit me up in the comments. This is awesome. I’ve been writing my dates this way for YEARS, because its the logical ‘alphabetical’ sort order in computer systems. I know, me too! It’s way cool to learn that this is the standard!